Our unique multi-wrap overlay system is the ultimate for added support through the instep and heel pocket. This all rubber binding brings back the support and comfort your feet deserve. 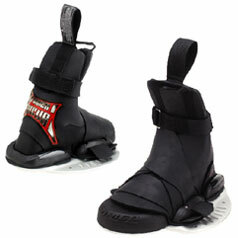 An added toe strap for response and the dual density foot bed complete this winning combination of support and comfort. The Focus bindings are great. The footbed is nice, thick and cushy (much better than my 30/60s footbed). The overlays and heel/toe material really comform to my feet which gives them even pressure all around. No break-in time required. Perfect right out of the box. I can't think of a better binding for poking out grabs. The only negative I have with them is that with the rubber being so flexible, my heel slides sideways slightly on landings (reason for 4 stars instead of 5). Other than that, these bindings are great. E-bay price of $99 plus shipping was an added plus.